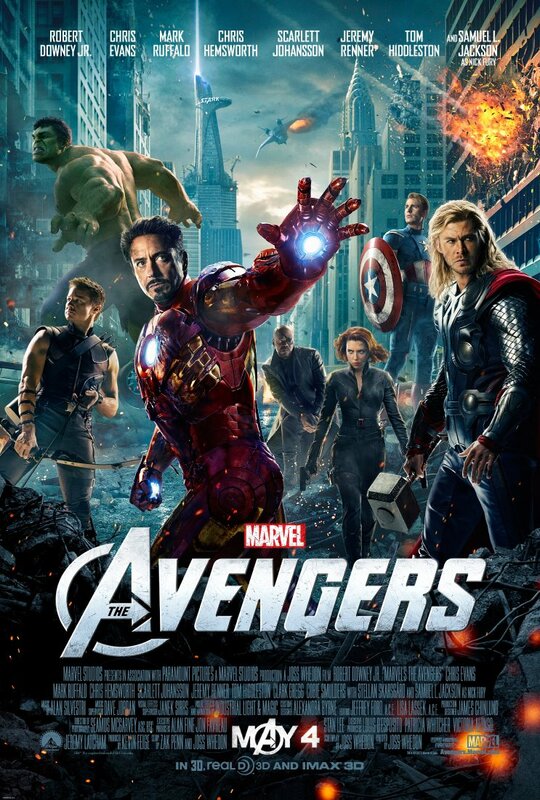 This past Saturday, thanks to a former classmate’s random act of kindness, I was granted the opportunity to see the much-anticipated Marvel’s The Avengers at its New York City première on the closing night of the Tribeca Film Festival. [i] Now, as it happened, traveling to the Tribeca Performing Arts Center from my home in New Jersey took me through the PATH station at the World Trade Center. Though I’ve wanted to go down there many, many times over the last few years, due to some deeply-held and overpowering emotions this was actually the first time I had visited the site since after September 11. As I stepped out of the station, located at the foot of One World Trade Center, I gazed up at the still under construction Freedom Tower. Though I expected to be slightly more overcome by emotion than I actually was, I nonetheless experienced a deep sense of poignancy that stayed with me as I headed over to the screening itself. 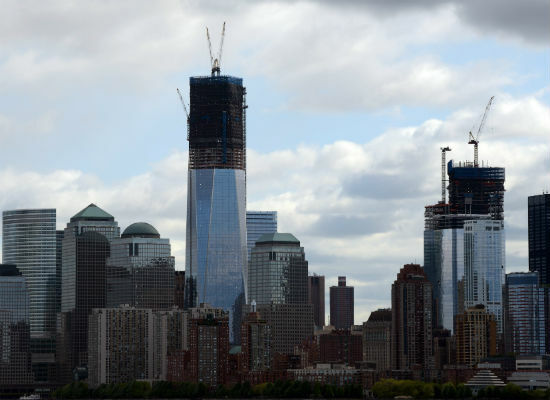 The still incomplete One World Trade Center – the building replacing the Twin Towers – which as of this week became New York City’s tallest building. The Tribeca Film Festival, it should be noted, has its roots in the aftermath of September 11, founded as it was to help restore some economic vibrancy to its namesake New York neighborhood after the attacks, and to bolster and maintain the city’s vaunted status as a cultural Mecca – especially in regards to that greatest of art forms, the cinema. Prior to the screening, and just after Festival co-founder Jane Rosenthal welcomed everyone and thanked them for attending, Robert Downey, Jr., onstage amid other members of the film’s cast – Mark Ruffalo, Chris Hemsworth, Tom Hiddleston, Colbie Smulders, and Clark Gregg – explicitly referenced that the eleventh anniversary of September 11 was on the horizon, and on behalf of his costars, dedicated the film to the First Responders, stating that it was they who were the “real heroes.” Members of the FDNY, NYPD, and the Port Authority rose to their feet upon their being acknowledged, and in response, all the celebrities, movers, shakers, wealthy sponsors, and their assorted families, friends, and hangers-on (and, of course, me) in attendance gave them all a rightfully deserved standing ovation. 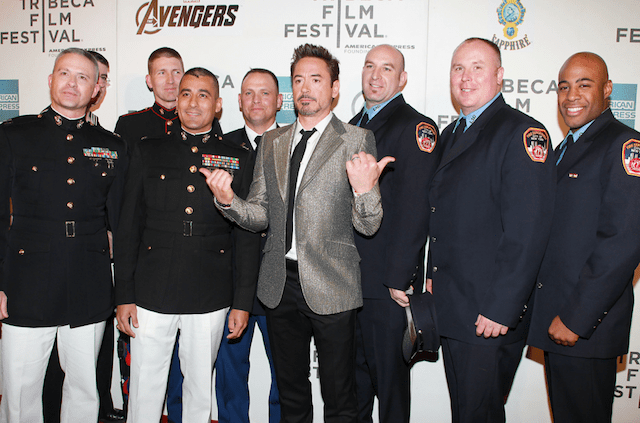 Robert Downey, Jr., the biggest star of “Marvel’s The Avengers,” poses with some of the September 11 First Responders and members of the military on the red carpet at the Tribeca Film Festival. Though I’ve never especially been what one would call an “Avengers” fan, I felt particularly blessed to have seen the film on that night, in that place, and in New York City, especially given the film’s climax. For those who may have missed the movie poster, television spots, theatrical trailers, or any other manifestations of the movie’s marketing blitz I may be overlooking, (spoiler alert) the film culminates with the eponymous superhero team coming together to stop an alien invasion of New York City, with Manhattan itself as the battlefield. It’s an odd kismet that The Avengers is being released the same week that One World Trade Center officially became New York City’s tallest building, and when the one year anniversary of the death of Osama bin Laden is being marked all over mass media, especially here in the NYC area, and arguably exploited by both sides of our deep political divide. Truly, and I in no way intend this as a trivialization, bin Laden was himself to the American consciousness the real-life manifestation of the ultimate super-villain, an untouchable mastermind heading a phantom network of devoted followers, who proved himself capable of causing horrific carnage and loss, and who, for all we knew before his death, may have planned to do so again. While many one year ago wrung their hands and posted quotes on social networks by Martin Luther King, Jr. and others, concerned over the display of so much triumph and joy at the death of one man (as is their right and prerogative), his vanquishing represented much-needed psychic relief and a sense of justice for many of us who felt they were living in a world where, more and more, true justice seemed to be in such short supply. 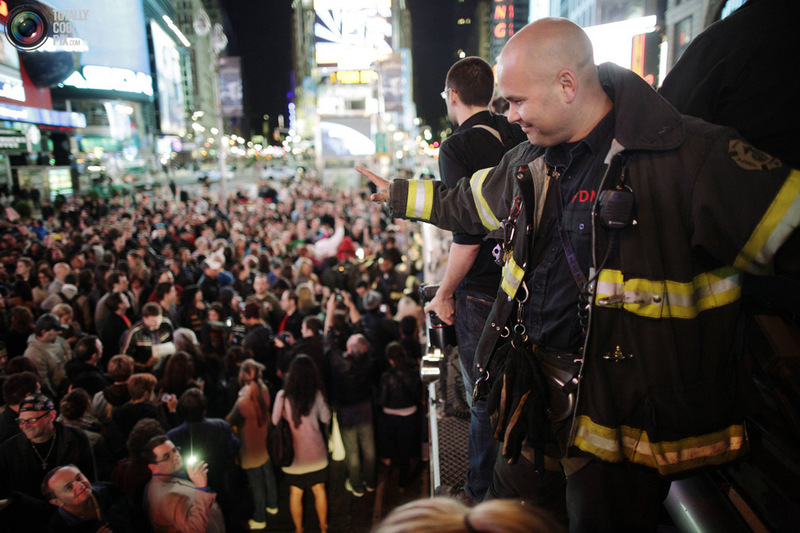 A spontaneous celebration at Times Square about one year ago, shortly after the news of Osama bin Laden’s death was announced to the world. Within the absolutely epic finale of The Avengers, which at almost half an hour in length represents one of the best action set pieces in recent movie history, New York City itself hardly comes out unscathed. But for nearly everyone in that audience in Tribeca, there was nonetheless an undeniable uplifting symbolism in seeing the World’s Greatest City, so symbolic of both American progress and globalization, being defended to the last by “Earth’s Mightiest Heroes.” Whether anyone there chose to view, consciously or unconsciously, the heroes as emblematic of the First Responders who lived up to their name and then some on September 11, or just to our own national consciousness after our long period of healing, refusing to stand by helplessly while being threatened again, the finale delivered a rush of enthusiastic defiance and pride that completely transcended the often excellent action displayed onscreen. Cast members from “Marvel’s The Avengers” at the Tribeca Film Festival; on behalf of the cast, Robert Downey, Jr. dedicated the film to September 11’s First Responders. It’s certainly no coincidence that superhero films became so prevalent in the aftermath of September 11, when our society, perhaps subconsciously, needed representations of heroic figures to embody its own desires, frustrations, and fleeting idealism. In fact, this week also marks the tenth anniversary of the original release of Spider-man, which marked the reemergence of the superhero film after Hollywood spent most of the nineties running it into the ground. As the genre matured over the last decade, the films themselves began to more allegorically reference September 11 and especially its widespread aftermath (Christopher Nolan’s The Dark Knight and the first Iron Man being the most salient examples). 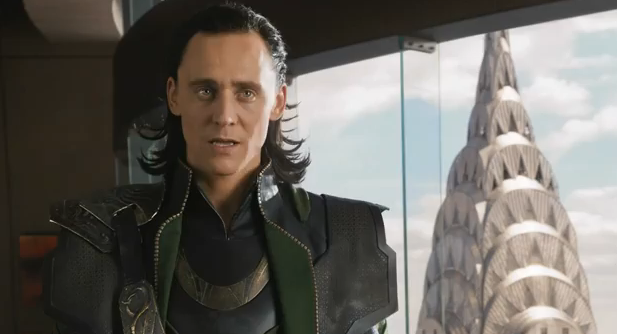 In The Avengers, director and writer Joss Whedon, undeniably one of our greatest and savviest pop culture auteurs, consciously displays similar symbolism with his own entry into the genre; the aspiring despot and villain Loki has more than one soliloquy mocking the vagaries of “freedom,” a concept used only a few years ago to justify a bloody and needless war, and the notion of so many disparate personalities actually – GASP – working together for the greater good (!) has undeniable relevance to our present fractured and acrimonious political climate. Yet lest I make the error of making the film seem otherwise as dark and portentous as some of its cinematic relations, I cannot emphasize enough that The Avengers is, first and foremost, unabashedly exciting, entertaining, and fun. Indeed, it succeeds far more at being mass entertainment then some of its arguably better brethren (such as The Dark Knight); the refreshing emphasis on humor present in the other Marvel-produced films gets kicked into overdrive here along with a renewed focus on the kind of action that other films of its oeuvre have occasionally treated as an afterthought (again, such as The Dark Knight). For all its symbolism, for better or worse, The Avengers isn’t a film that’s going to cause you to think deep thoughts about where you lie on an issue of import. What it will do is give you the kind of adrenaline rush that comes from having experienced a true thrill ride, and a sense of catharsis that emphasizes why our culture so believes, and values, true heroism. The villainous Loki (Tom Hiddleston) posed against the New York skyline he’s about to try and destroy. Representing four years and five somewhat inconsistent films in the making (Iron Man, The Incredible Hulk, Iron Man 2, Thor, and Captain America), the buzz surrounding The Avengers inevitably makes it feels like less a tent pole than the tent itself, and thus its all the more to Whedon’s credit that he’s crafted an event movie that managed to not only deliver on its copious hype, but surpass it. Armed with a massive budget and an ideal cast, Whedon penned a screenplay that correctly sacrificed plot in favor of character and spectacle, just like any great comic book would. Though he no doubt benefited in large part from having any and all cumbersome origin stories helpfully wrapped up by the earlier movies, Whedon still presented well-fleshed out characters rife with their own intellects, idiosyncrasies, ideals, and emotions. What I found especially gratifying, too, was that he really didn’t give any of the heroes either the short shrift or an excess of the spotlight and thus developed all of them equally – even though the Hulk kind of steals the show in the finale (and should earn himself another shot at his own franchise in the process). I was particularly pleased that the Black Widow, as the only real female Avenger, received her due after being treated as little more than a plot device in a form-fitting bodysuit by director Jon Favreau and writer Justin Theroux in Iron Man 2. The talented Smulders, unfortunately, doesn’t end up treated as anything more than window dressing here; though as windows go, it’s hard to complain too much. I was also disappointed that we didn’t see a return appearance by War Machine from Iron Man 2; when your only actual person of color on your superhero team is the green dude, Jackson’s Fury notwithstanding, you might have representational issues. Besides, I’m sure Whedon could have had a lot of fun with Don Cheadle in his cast. The Black Widow (Scarlett Johansson) – thankfully, Joss Whedon treats her character as more than just a pretty…um…face. Again, though, where the film truly scores is in its sumptuous action scenes and sometimes hilariously witty dialogue (the director’s trademark “Whedonspeak”). Whedon astutely understood that the job of his film was to be neither introspective nor reflexively self-important as so much comic book media strives to be these days, but to represent what comics are at their most basic: rousing and fun. The true appeal of superhero stories, removed from all their psychosexual hang-ups and violent fetishism, lies in colorful, involving characters and exciting action. As a movie spectacle, The Avengers delivers on this in spades, with its heroes fighting among themselves in one great fight scene after another, all building up to the last amazing battle in New York City. 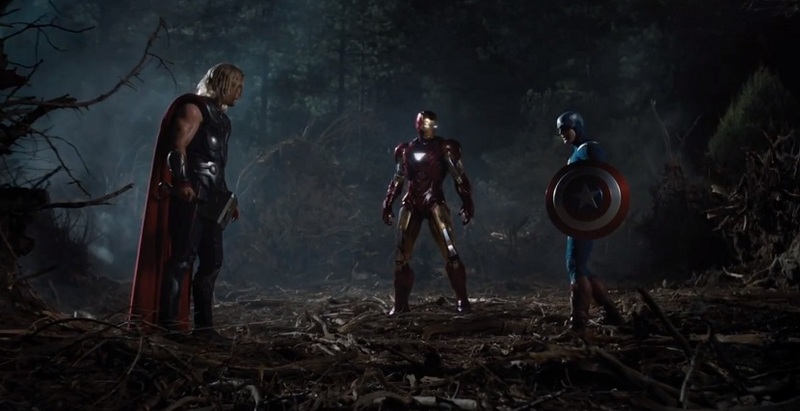 Thor (Chris Hemsworth), Iron Man (Robert Downey, Jr.), and Captain America (Chris Evans) surveying their own carnage. In the end, The Avengers lacks the requisite depth and narrative strength to make it among the very best of the last decade of superhero cinema (I would still give that to position to The Dark Knight), but darned if it might be the most fun of them all, and the one that benefits the most from coming at a time when many aspects of September 11, though certainly not all, have finally seen some degree of closure. 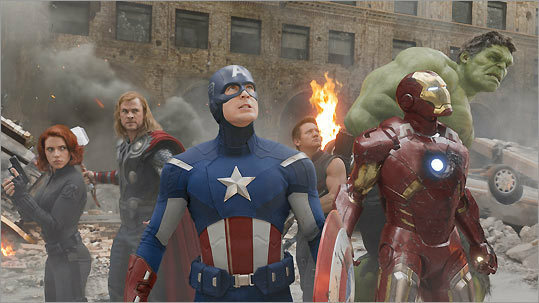 While other superhero films of the last few years have no doubt reflected the traumas and philosophical conflicts of a post-terrorist society, The Avengers felt like a film that was giving us a peek into a hopeful aftermath of that era, of a society and culture that stands together despite its differences against the threats, existential and otherwise, that seek to hurt it, and that will always celebrate, and remember, its heroes. 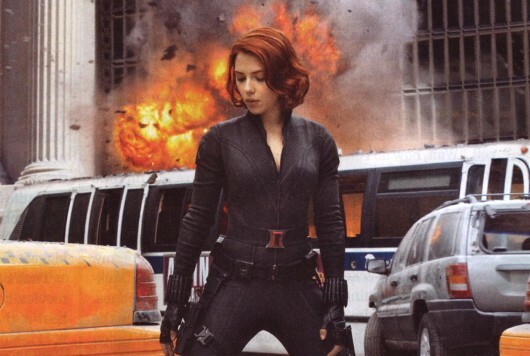 Posted on May 3, 2012, in The Antiscribe Analyzes (Essays), The Antiscribe Appraisals (Reviews) and tagged black widow, captain america, First Responders, hulk, iron man, joss whedon, marvel, new york city, robert downey jr, September 11, the avengers, thor, tribeca film festival, world trade center. Bookmark the permalink. Leave a comment.